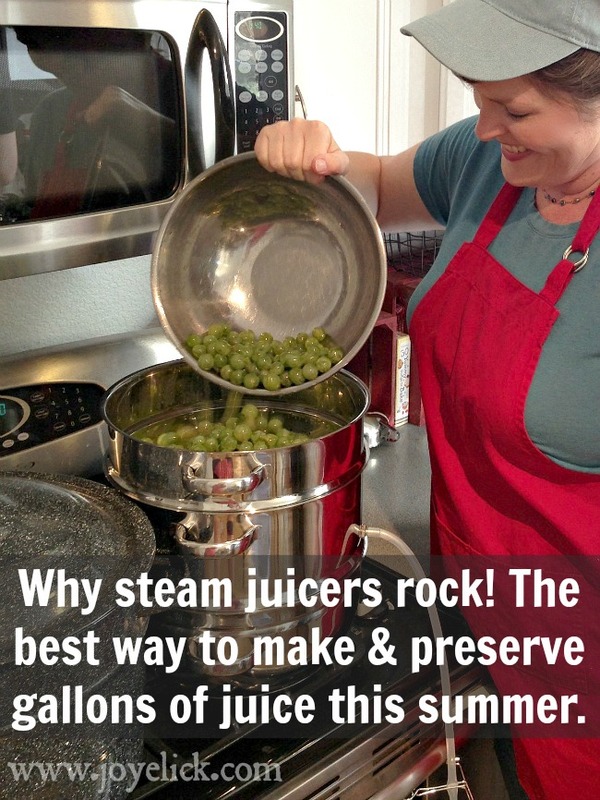 Why STEAM JUICERS rock! Discover the best way to make and preserve gallons of juice this summer. She's my kid sister, the youngest in my family of four girls, but she and I are homestead buddies. Elli's super resourceful. 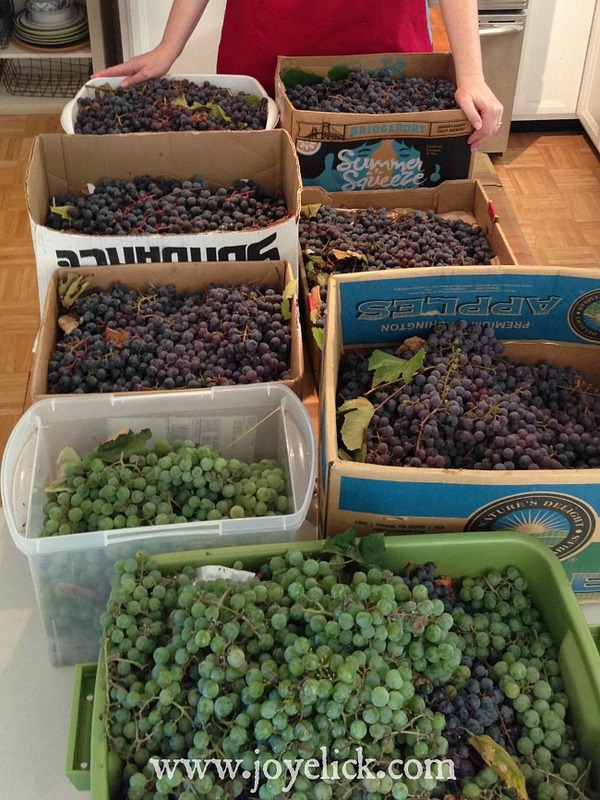 She showed up here with her Toyota pick-up jammed with all these boxes of grapes she'd gleaned and foraged from several locations (a totally crazy amount of grapes, let me tell ya)! She said if I bought a steam juicer, we could make juice together and split it between us. Cool! I went right out and bought an awesome steam juicer, by Victorio (which, by the way, has been one of the best kitchen tools I ever purchased)! You're going to see it in action today. 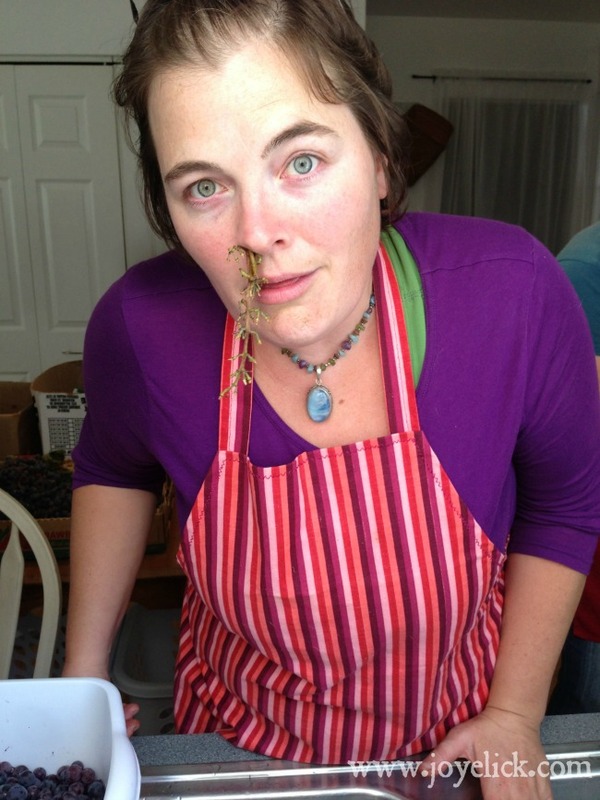 We had soooooo many grapes to de-stem, that everyone got involved. We set up in our "other kitchen" (the house we bought is an old duplex, that's half-way converted to a single family home, so for now we have a "project kitchen"--which is way cool when you're doing something that takes over everything). I'd like you to meet Elli, my little sis. Hanging out together this way is how we like to spend time together. We talk and talk. 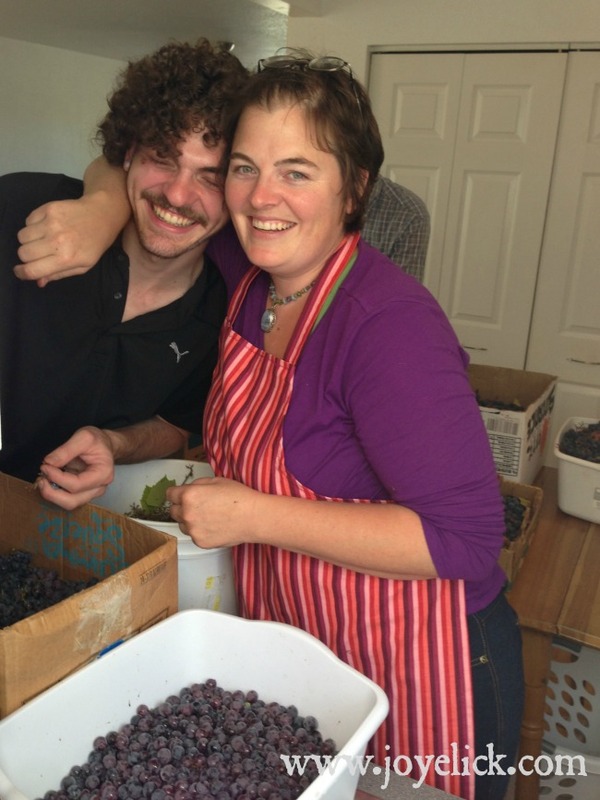 On this juice making day, we talked about creating a family farm with multiple dwellings, about dating (her), and parenting (me), and about how different our childhoods were because she was so young and I was so much older when our parents got divorced. I guess that's what happens when people get together in a kitchen (for what turned into three days) to share good old fashioned work together. When the work started getting dreary, we had music. This is my honey, George. He looks very serious. Probably because the music is getting on his nerves. Or all the girl-talk. But he enjoys getting in and helping with big kitchen projects, even though he has more than enough to do all over the farm. (What a guy)! Funny silly lovely girl, Elli. But hey, aren't the best memories made of such moments? Have you had enough? Me too. Let's talk juice-making shall we? To begin, I'll fill you in on what a steam juicer is and how it works, in case you're like me and never heard of this. I didn't even know what a steam juicer was before my sis told me about it. But I've since learned, they're not just for making juice. These nifty contraptions have multiple uses: They can double as a stock-pot, a veggie steamer, be used to cook pasta, and you can make not only juice, but syrups and jellies too. In the past, I only ever knew how to make fresh juice with a traditional juicer like the Omega juicer (a fabulous machine). 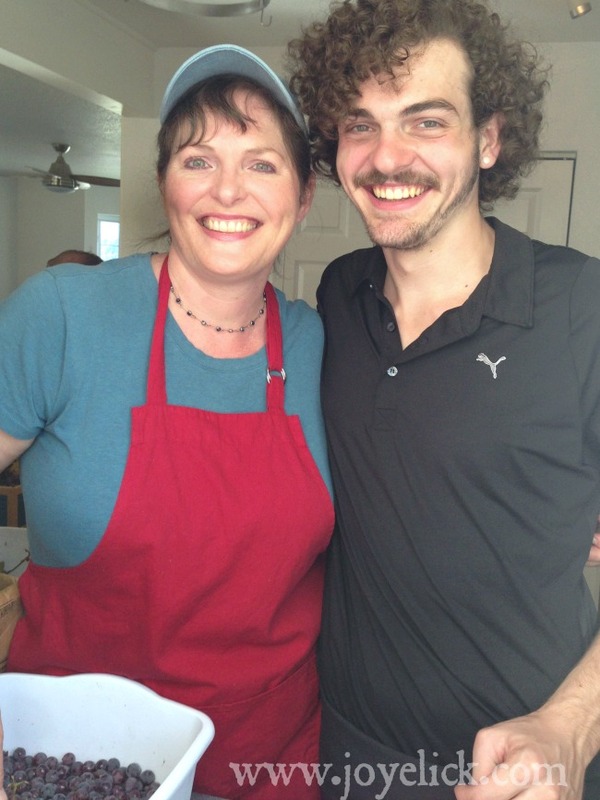 But now, my family makes both fresh and cooked juice. Each for its own merits. Both fresh and cooked juice have their place on a homestead. Fresh juice is amazing! You get tons of healthy enzymes and nutrients in fresh juice, because they haven't been cooked out. However, fresh juice is also super perishable. That's what makes canned juice so worthy. It can stay on the shelf a long time, and it doesn't require any refrigeration. 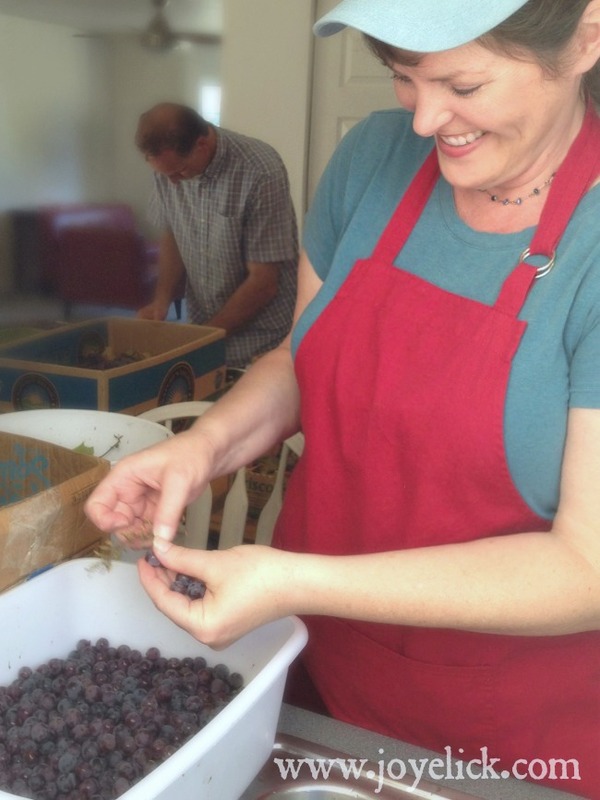 Then, in the middle of the winter, when fruits like grapes and berries are out of season, you can still pull out a jar of homemade grape juice for Christmas. Besides creating jars of juice that can be stored on a shelf, I think the biggest advantage to using a steam juicer is the crazy amount of juice it lets you make, compared to a fresh juicing machine. Steam juicers work by stewing the juice out of the fruit. You bring some water in the bottom pot to a low boil, place a bunch of fruit in the top steamer, then let the the steam do the work. As the fruit heats up, the juices get extracted and run down into the middle section of the juicer. A hose at the bottom of this section siphons the juice down into a pan, or right into your jars, if you do it that way. Pretty cool, huh? 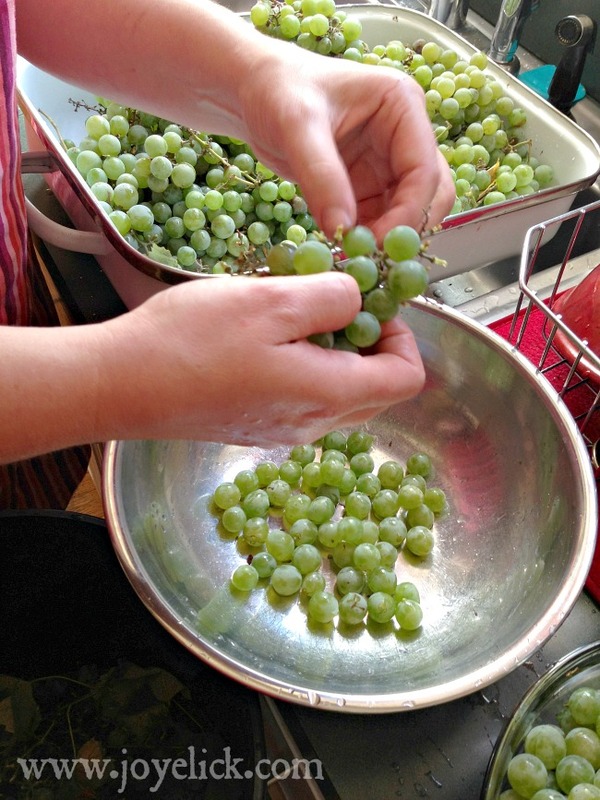 Berries and grapes: Remove all stems and discard any damaged fruit. Then wash the fruit and place it in the steamer. Apples, pears, and other fruits with cores: Wash fruit, remove stems and check for blemishes, then cut into quarters. Place cut fruit in the steamer (don't worry about the cores or seeds). Cherries, peaches, plums and other stone fruits: Wash fruit, remove stems and check for blemishes, then remove the stone (pit). Cut fruit into halves or quarters, depending on size and place in the steamer. If juicing any other fruit not mentioned above, just remember to remove any portions that you wouldn't normally eat before placing the fruit in the juicer. When it comes to making gallons and gallons of juice, a steam juicer is the absolute best way to go. 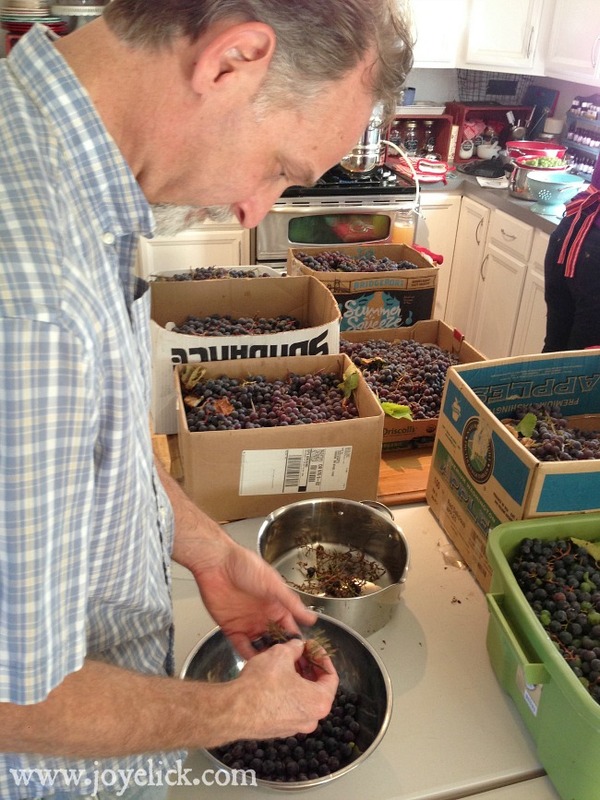 Today I'm going to show you how to make grape juice specifically. However, if you buy the Victorio steam juicer, it comes with an instruction manual and recipes for other juices, jellies and syrups. (Check out this kit; it contains the water-bath canner, lifter, rack and other tools). 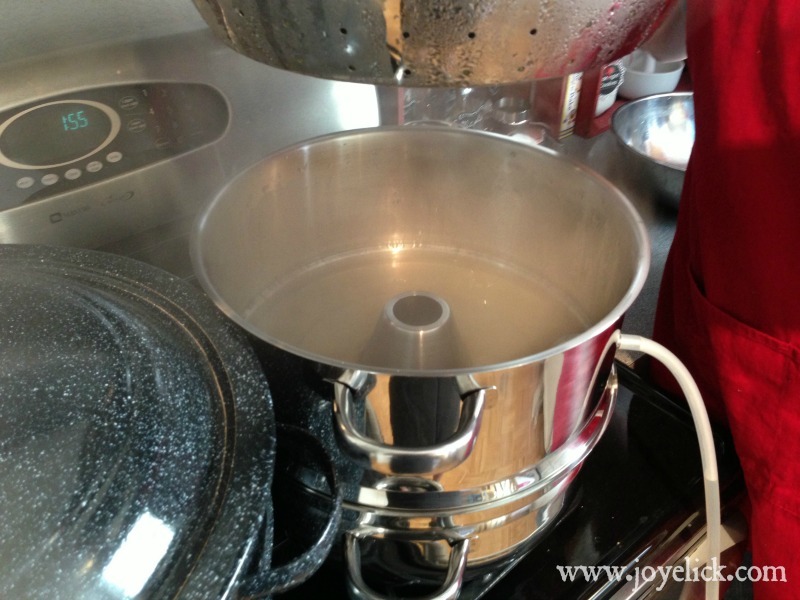 To get started, fill the bottom pot of your steam juicer with about 5 quarts of water and bring to a rolling boil. Once the water boils, begin turning the temperature down until it maintains a low boil. 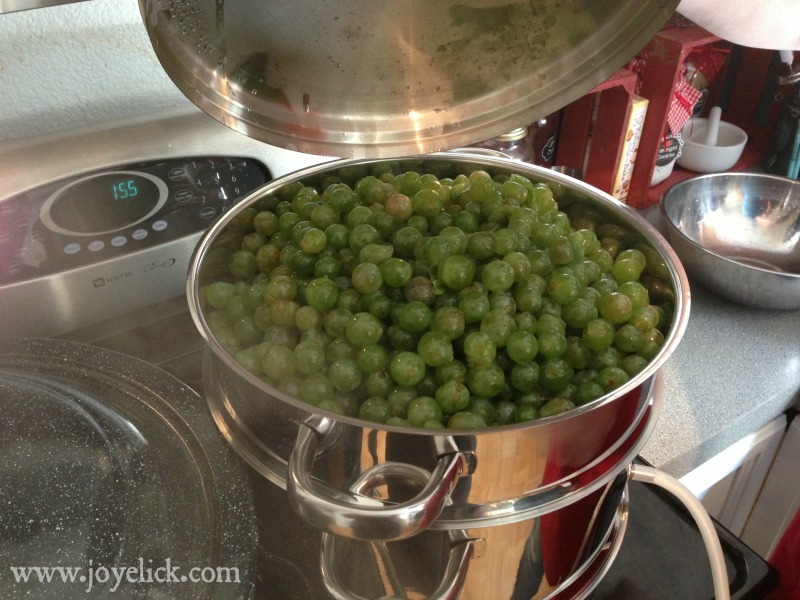 Place grapes in the colander on top (being careful not to overfill), cover and let the steam do its work. You can fit a ton of fruit in the colander (steamer) section which holds up to 8 quarts of fruit! But make sure the lid fits securely, or steam will escape and the steamer won't work properly. If the lid sits ajar, remove some fruit. 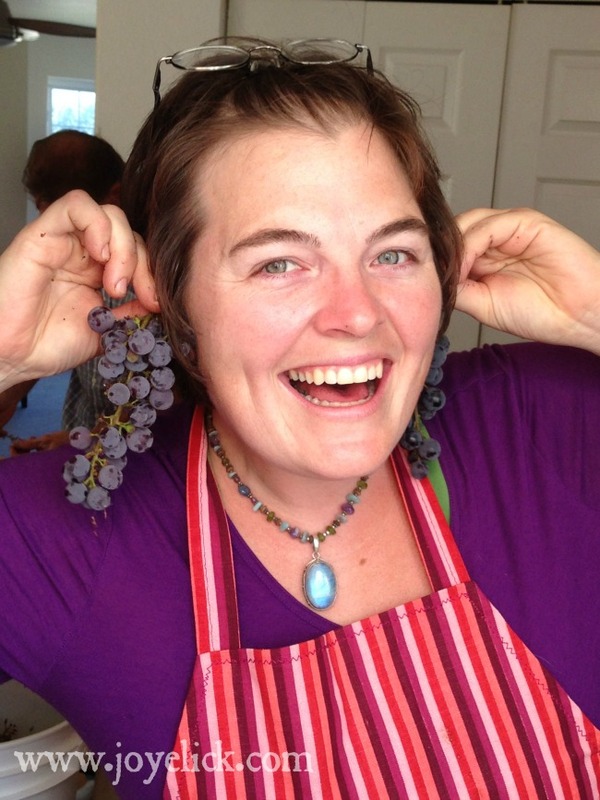 Note: If using sugar, just sprinkle it over the top of the grapes once the colander is filled. (Another way is to sweeten the juice to taste by cooking it in a pot with sugar later, but to me this seems inefficient, since you can do it as suggested and eliminate an extra step--which when you're making a hundred thousand batches of juice, who wants an extra step)?! As the fruit steams, juice (and sugar, if using) will drip down into the middle section called the juice kettle. This can hold up to 4 quarts of juice before it needs to be drained. In about an hour, you can start draining juice into whatever container you're using. We set a bar stool next to the stove just below the hose. You can drain juice into a pot or right into the jars you're using. It will take about 2 hours for one batch of fruit to go through the juicing process. Be sure to check for juice after about an hour, and don't wait too long to drain it, or it may overflow into the stockpot. If you're crazy like us and plan to juice 10 or so batches of juice, be sure to allow each batch to completely finish the process, then discard the waste before adding more fruit. Also, you may feel tempted to stir or mash the fruit to expel the juice faster, but this isn't a good idea. It will make the juice cloudy and could change its flavor. Always use heat protective gloves or mitts while working with your juicer. Everything about it is hot hot hot. Even the hose and clamp will get hot, so be careful. (Speaking from experience here). Don't let the stock pot boil dry. Be sure to check the water level frequently and add water when needed. Don't leave the steamer unattended (like don't go outside to water the garden or check the chickens while your juicer is in operation, unless someone else is keeping an eye on it). Refrigerate: Fill clean jars and store in fridge. Use within 1 week. Freeze: Only use wide-mouthed jars for freezing juice, as these and jelly jars are the only ones deemed freezer-safe by jar making companies. Leave 2 inches head-space in each jar to allow for expansion when frozen. Allow juice to cool to room temperature before placing in the freezer. Place jars with an inch of space between them in the freezer. 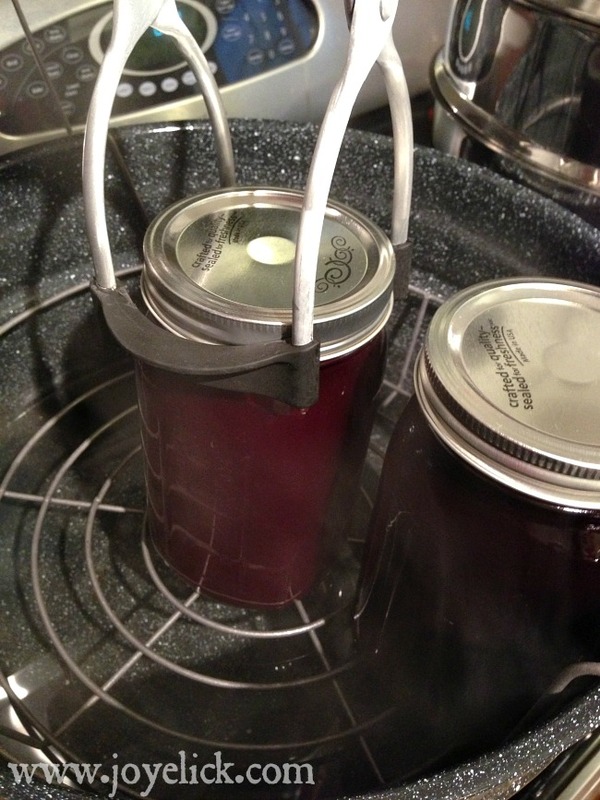 Water-bath Can: I'll describe briefly the canning process below, but for further instructions on how to properly use a water-bath canner, CLICK HERE. Guess how many quart jars of juice we ended up with from our juice-making bash, folks. Seventy-five. I said 75! Plus we made 14 pints of jelly. Amazing! If you don't have a steam juicer, consider getting one, my friend. Every homestead should have one. When canning juice, you'll need to sterilize your jars first. 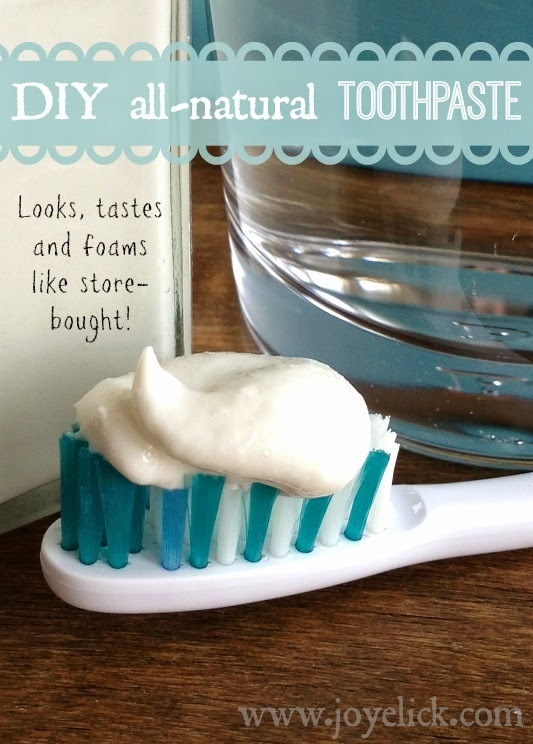 Wash jars with soap and water and rinse well. Place about 4 inches of water in a water-bath canner and place the rack in the bottom. Submerge the washed jars right-side up and arrange them on the rack so they don't touch each other. Top off with enough water to cover to 1 inch above the tops of the jars. Bring the water to a boil, and boil 10 minutes (boil an additional 1 minute for every 1000 feet of elevation. Then reduce heat and keep the jars in the hot water until ready to use. To use, remove and drain one jar at a time (but save the hot water in the canner for later processing). You may be wondering if you should also boil the jar lids. According to the manufacturer of Ball jars and lids, you don't. Apparently this is a recent change. 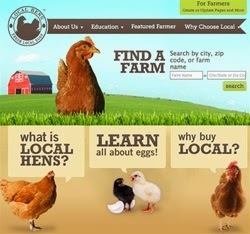 You can read all about it HERE. (It's a pretty interesting article). Long story short, just make sure your lids are washed and clean. 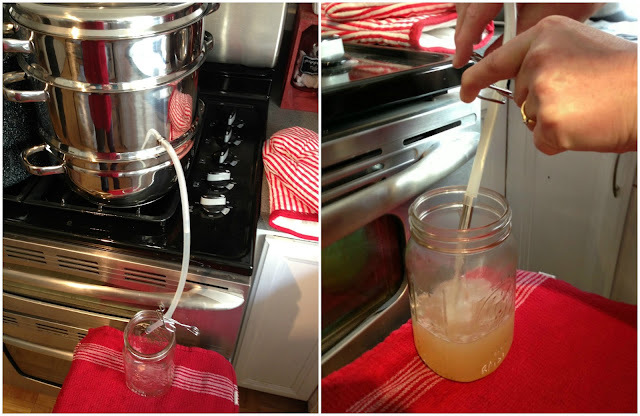 Using sterilized jars, fill with juice directly from the hose of the juice steamer. (Caution: Hose will be hot, so only touch the clamp to release the juice). Fill jars to 1/4 inch head-space. Wipe the rim of each of jar with a clean dampened paper towel. Adjust sterilized lids and screw on the rings (finger tighten only). Process in a water-bath canner according to your altitude. So you have juice--Now what? Pretend it's the middle of winter and you just used your last jar of grape jelly. The family is whining because they've turned into jam and jelly snobs and refuse to eat anything but Mom's homemade. So they pout and fuss, wishing there was more and frowning at the tasteless jar from the store (they'd rather eat a jelly-fish, or so they say). What to do? Answer: Use the homemade juice in your pantry! Give those whiners what they're crying for. (I'm just kidding. I know your family doesn't have whiners in it). As long as your juice is unsweetened and 100% juice, you can use it to make jelly, even if it was canned months ago. (By the way, 100% juice is something hard to find these days at the super-market. I dare you to try. Go read some labels on juice products and you'll see how few contain 100% juice with no additives, no added sugar or water or other concentrates). So if you run of out jelly before next grape season, all you have to do, my fellow homesteader, is grab a couple jars of last summer's unsweetened juice from the shelf and whip up some jelly. (I love that feeling of self-reliance, don't you)! What to do with the rest of juice? 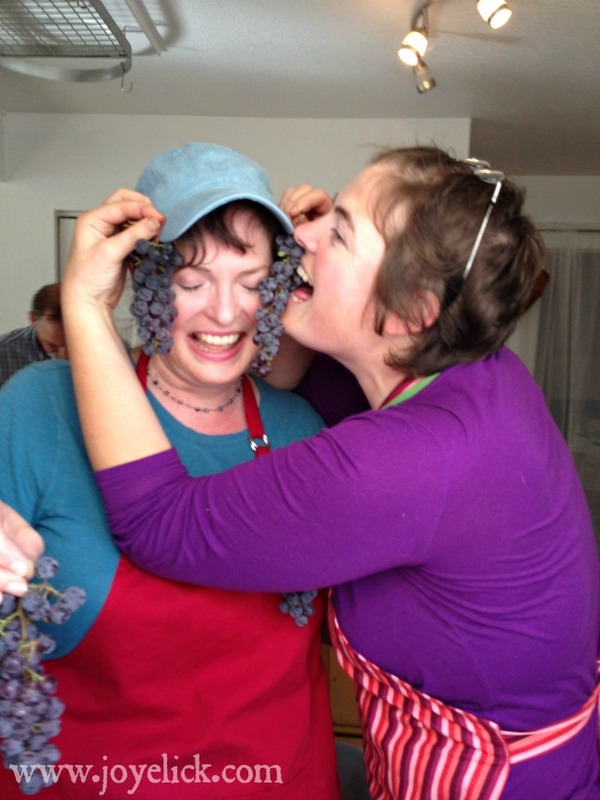 Besides being prepared to make what you need (when it comes to the family crisis of jelly-lack), you can do the obvious with all that juice on your shelf: Drink up and enjoy! But leave a jar or two for the jelly-babies. Awesome, I enjoyed reading your article. What are the white grapes? 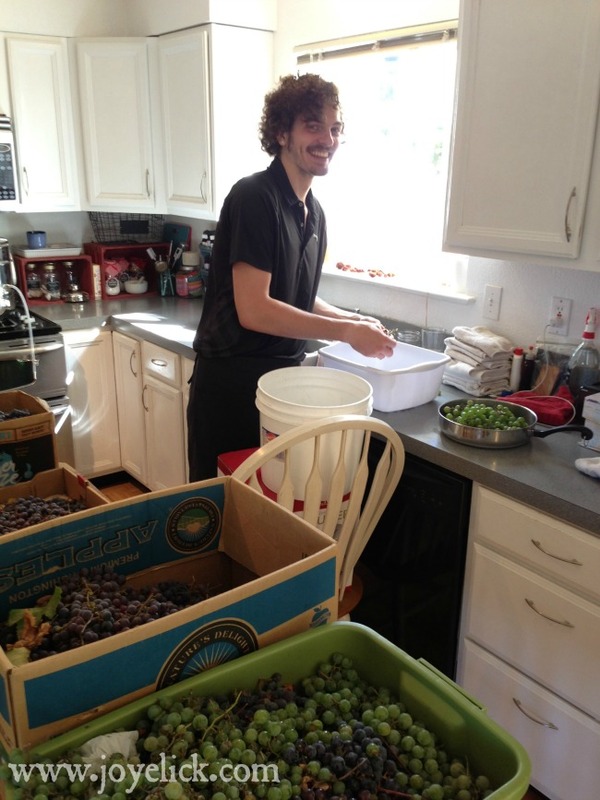 I've been using a steam juicer for our home grown concords, but I would love a white grape option. Hey Rachel, I wish I knew exactly what kind these green grapes were, but we don't know, because they were gleaned and foraged. They weren't table grapes and they had seeds. That's all I know. This was extremely helpful and informative!! I just got my juicer based on a recommendation and was stumped by it, I feel a lot better after reading your article. Thank you! Hi Cinagro Farm. That's awesome that you just got a juicer. I'm excited for you! Glad you found this helpful. 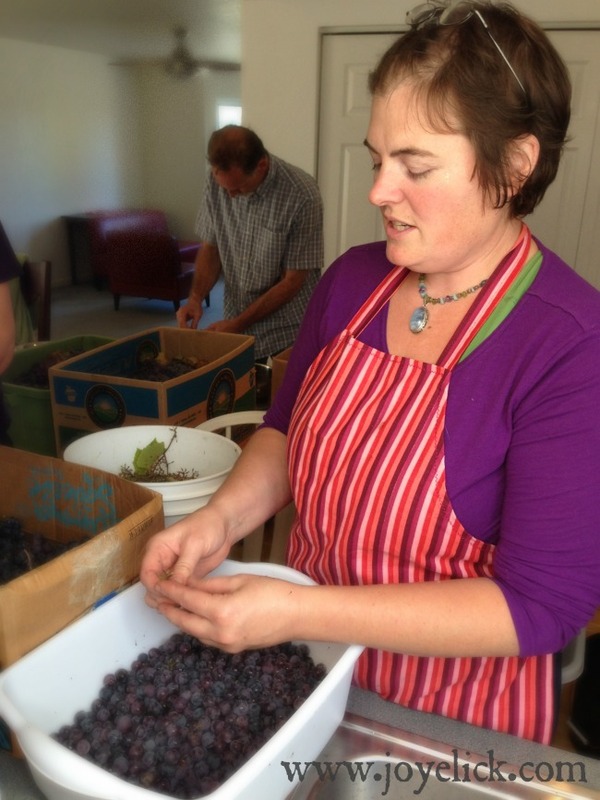 Are you making grape juice? Enjoy you juicer. Hey Lisa, thanks for the tip about keeping the stems in! I dont water batg either. I fill the jars with the hotjuice, boil the lids and put them on with the rings. They seal as they cool off. I've been doing it this way for years and they seal everytime. 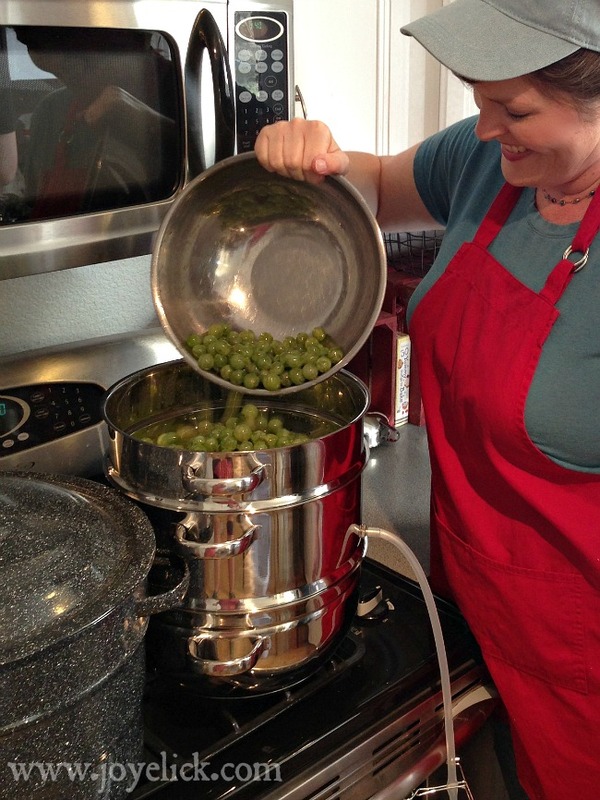 I was busy looking through posts about other things to do with my steam juicer & was reading your post... but I'm wondering why you go through all the extra work to remove stems...I just wash my grapes & throw everything in! So... much easier! More a question than a comment... Has anyone tried leaching the tannins out of acorns using a steam juicer? Does the steam juicer work for less juicy things like cranberries and carrots?